Shares of Subhash Chandra's Essel Group tumble after a news website's reported his company was being probed by fraud investigators. 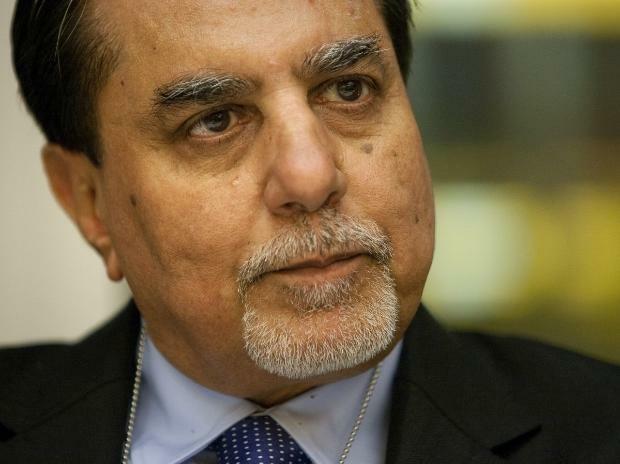 The media mogul behind India’s biggest television network is battling to restore confidence in his businesses after an online news site reported that Subhash Chandra’s Essel Group has links to a company that’s being probed by fraud investigators. It began Friday, when a report by the Wire sent all of Essel’s seven listed units plunging, including a record 27 per cent tumble at Chandra’s flagship TV broadcaster, Zee Entertainment Enterprises Ltd. A barrage of denials and statements from the conglomerate since helped Zee and its two affiliates recover some of their losses on Monday, while the remaining Essel units continued to fall. Essel’s PR blitz also unearthed some potentially broader issues: The closely held group had been scrambling to sell assets, including a big stake in Zee, to pay debts. The group emerged as the latest example of the growing number of Indian businesses struggling to cope with tougher borrowing conditions after the government began taking steps to lower the world’s second-highest ratio of bad loans. The episode increased the urgency for Chandra to sell as much as half of Essel’s 42 per cent stake in Zee, according to Nirmal Gangwal, founder at advisory firm Brescon & Allied Partners LLP. The shares that Essel is putting up for sale are valued at about $1 billion, based on the latest closing prices. "It is critical for Zee to find a definitive buyer for the proposed sale to arrest erosion of value of the company," Gangwal said. According to the Wire, a little-known company called Nityank Infrapower is being probed by the Serious Fraud Investigation Office and has been involved in various transactions involving the conglomerate. In one occasion, a Nityank-backed firm lent more than $140 million to a company backed by Essel, according to the report. The Wire didn’t report that Essel is engaged in fraud but went on to question how an obscure company like Nityank could get involved with a large one such as Essel, even providing security for loans taken out by Essel companies. Essel countered by saying the conglomerate had nothing to do with the fraud probe and that Nityank was independent of the group. Contact information for Nityank officials weren’t immediately available, while the SFIO declined to comment. Among other Essel units, Zee Media Corp., SITI Networks Ltd. and Shirpur Gold Refinery Ltd. plunged between 18 per cent and 19 per cent on Monday, extending Friday’s rout. Zee Learn Ltd. slumped 7.5 percent. Dish TV India Ltd. fluctuated between gains and losses before settling 6.7 percent higher. 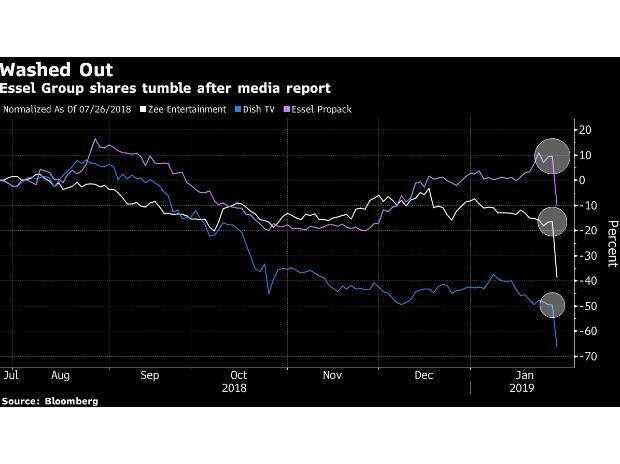 Zee Entertainment, which boasts 1.3 billion viewers across 173 countries through its 78 channels and 4,800 movie titles, surged 17 per cent but that recovery was less than half of the losses it saw in the previous session. A lot is riding on the stock’s price because the sale of Zee Entertainment’s stake would allow Essel to pay all its dues, according to Chandra. The problem with Essel’s stake is that 59 per cent of it has been pledged as collateral to borrow money from creditors, putting those shares at risk of being seized and dumped if the price falls below certain thresholds. Friday’s plunge caused various covenant breaches but the group reached an understanding with 97 percent of its lenders, Zee Entertainment Chief Executive Officer Punit Goenka said on a call on Monday. Zee Entertainment is also trying to sell stressed assets for an enterprise value of 200 billion rupees ($2.8 billion). It isn’t clear how much Essel owes its creditors and who those creditors are -- group officials won’t say. Zee Entertainment analysts weren’t spooked by the events in the last few days. More than 70 per cent have a buy rating on the stock and none had cut their assessments as of Monday. Chandra, who started Zee in 1992, has been saying that he planned to sell the stake to secure financial backing, while capitalising on booming demand for Indian content. According to the Business Standard, a slew of companies ranging from Amazon.com Inc. to Apple Inc. and Sony Pictures Entertainment Inc. are among companies interested in buying the Zee Entertainment stake. The TV company’s profits in the latest quarter surged 75 per cent jump in profit to 5.6 billion rupees on sales of 21.7 billion rupees. “Post the sale process, we will be positively able to repay the entire dues, but if the lenders react in a panic situation, it will only hurt them and us,” he said.